Joseph Wilfred Barker was the third child of Tom Edward and Mary Ann Barker, born on 16 July 1894 in Darlington. On some records, including his medal inscriptions he is known as Wilfred. Joseph’s parents, his two brothers and sister were also all born in Darlington. Joseph’s father was a railway worker. Joseph was working as a motor car fitter at the time of the 1911 census but followed his father to work on the railways later in life. Joseph was baptised on 12 August 1894 at St Paul’s Church in Darlington. At the time of both the 1901 and 1911 census the family were living at addresses close to the railway in Darlington; 29 King William Street and then 2 Dundee Street. In 1901 Mary’s parents Edward and Mary Rowell were also living with the family. Joseph served in the 18th Battalion Durham Light Infantry (DLI), the Durham Pals. He was initially ranked as a private but later became a sergeant with the service number 918. He initially fought in Egypt and joined the troops there on 22 December 1915. On 1 July 1916 during the attack on the German trenches at Serre, Joseph was badly wounded. A copy of his diary reports he had a shrapnel wound to his shoulder, for which he was shipped to England a few days later. The diary contains a letter written to his parents on the eve of this attack. He was awarded the Distinguished Service Medal (DSM) for his actions in July 1918, reported in the London Gazette on 30 October 1918: ”For Conspicuous gallantry and devotion to duty in action. Under galling machine-gun fire he, with an officer, drew wounded men into a shell-hole for cover, and shot two enemy who called on them to surrender. Sixteen more enemy then rushed up and threw hand grenades, one of which fell by the side of the wounded men. Sgt. Barker promptly picked it up and threw it back, killing two of the enemy. He and the officer then killed seven more of the enemy with their rifles, and drove back the remainder. This NCO by his splendid resolution and courage inspired all who saw him”. 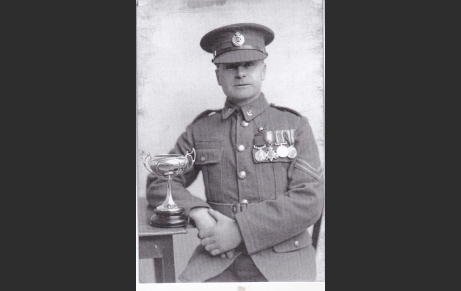 In addition to the DSM Joseph was awarded the 1914-15 Star, Victory Medal and the British War Medal, which are part of the DLI medal collection. He joined the Royal Air Force after the First World War and went on to serve in the Royal Engineers during the Second World War. Joseph married Doris P Brown in Darlington in 1921. During his life Joseph spent time working with British Rail in Darlington and it was in Darlington he died at the age of 76 in 1970.